Ruby Margo, who celebrates her batmitzvah tomorrow at Harrogate Hebrew Congregation, loves playing the piano and acting. No stranger to treading the boards, she played the role of Granny in a school production in Pannal of The Amazing Adventures of Super Stan. Ruby also loves sport and plays in the netball team at Harrogate Grammar School. Her siblings are Milly, 15, 19-year-old Nathan and Charlie, 12, who was barmitzvah at Holland Road Synagogue, Brighton. 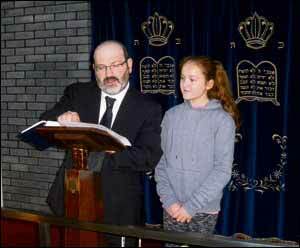 Ruby has been tutored by Rabbi Jason Kleiman, of Leeds, who will also be conducting the Shabbat service.